JESUS CHRIST IS GOD AND HIS LOVE IS STRONGER THAN DEATH. The implications of Christ’s Resurrection. 2.1. Jesus Christ is the true Son of God who has triumphed over death, sin and the devil. 2.2. Jesus’ love for us is stronger than death. 2.3. If we have been raised with Christ, we must seek the things of the above where Christ is: live a life that leads to Christ. In order for Christ to live in us, we must die unto ourselves, give death to a life of sin and live for God. “The Lord is truly risen, alleluia. St. Augustine once said that it is not difficult to believe that Our Lord died: even the pagans and Jews believe that. The great thing with our faith precisely is to believe that Jesus Christ has resurrected. St. Paul says: “If Christ has not been raised, our preaching is in vain and your faith is in vain (1 Cor 15:14).” Vain is our faith, vain is our hope, all our struggles and our efforts. Our faith in the Risen Christ comes to us through the Church which over the centuries transmits the testimony of the apostles who saw the tomb empty and the burial clothes rolled up, and believed (Gospel, Jn 20:1–9). Furthermore, they saw Our Lord appearing to them and ate and drank with Him after His Resurrectrion (1st reading, Acts of the Apostles 10:34a, 37–43). 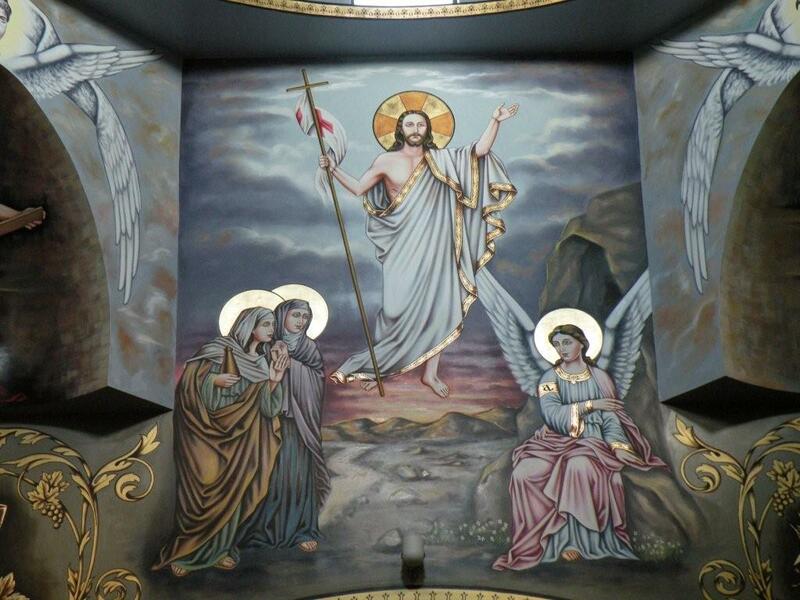 The fact of Our Lord’s Resurrection has many implications and consequences (2nd reading). 2. The implications of Christ’s Resurrection. In the 1st place, with His Resurrection, OUR LORD WISHES TO CONFIRM US ON THE TRUTH OF HIS DIVINITY, SHOWING US THAT HE IS TRULY GOD OMNIPOTENT, WHO HAS CONQUERED DARKNESS, DEATH, SIN, EVIL AND THE DEVIL. After the sadness of Black Saturday, a joyful day ensues. Illumined by the breaking of the day, the triumph of Christ has become a reality through the HISTORICAL EVENT of his Resurrection. JESUS CHRIST IS ALIVE! Jesus is alive. He is not just a figure to be remembered, a figure which belongs to the past, an abstract mixture of words, actions, promises, devoid of content. Rather, JESUS CHRIST IS TRUE GOD AND TRUE MAN WHO WAS BORN IN ORDER TO DIE FOR US SO THAT WE MAY HAVE LIFE. DYING HE CONQUERED DEATH; TO THE DEAD, HE HAS GIVEN LIFE. “This is the night in which even now, throughout the world, sets Christian believers apart from worldly vices and from the gloom of sin, leading them to grace, and joining them to his holy ones. This is the night when Christ broke the prison-bars of death, and rose victorious from the underworld. The sanctifying power of this night dispels all wickedness, washes faults away, restores innocence to the fallen, and joy to mourners. Moreover, In the second reading St. Paul reminds us that we have been raised with Christ, through faith and baptism, and that, therefore, we must seek the goods of heaven where Christ is, the propitious Victim of the Passover (cf. Sequence and alleluia). Hence we must live a life that leads us to Christ, which is Christ’s life itself. And living His life is nothing else but to strive to faithfully follow Christ, to strive for holiness, identifying ourselves with Him. 3. In order for Christ to live in us, we must die unto ourselves, give death to a life of sin and live for God. May the Joy of Christ’s Resurrection fill your life and that of your loved ones! May His Glorious Resurrection renew each one of us and stir us to say “yes” to God’s love and to live a new life, Christ’s life which leads to the glory of His Resurrection. AUDIO CREDIT AND SOURCE: MIT Chamber Chorus’s performance of Hallelujah from Handel’s Messiah in https://archive.org/details/GeorgeFridericHandelHallelujah Usage Attribution-NonCommercial-ShareAlike. Taken from http://hebb.mit.edu/FreeMusic. SEVILLE HOLY WEEK. ESPERANZA DE TRIANA.